482 Beacon is located on the north side of Beacon, between Hereford and Massachusetts Avenue, with 480 Beacon to the east and 484 Beacon to the west. 482 Beacon was designed by Ernest N. Boyden, architect, and built in 1892-1893 for Eugene Hamilton Fay, for speculative sale, one of five contiguous houses (482-484-486-488-490 Beacon). 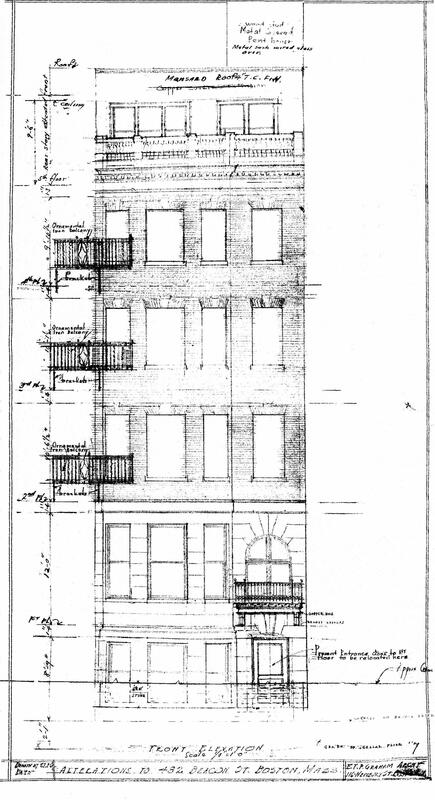 He is shown as the owner on the original building permit applications for 484-490 Beacon, all dated June 11, 1892 (the application for 482 Beacon has not been located). Click here for an index to the deeds for 482 Beacon. On April 5, 1893, 482 Beacon was purchased from Eugene Fay by Henry Melville Whitney. He purchased 486 Beacon and 490 Beacon on the same day. Henry Whitney and his wife, Margaret Foster (Green) Whitney, lived in Brookline. He was a coal and iron manufacturer and president of the Metropolitan Steamship Company and the West End Street Railway Company. On October 25, 1893, 482 Beacon was acquired from Henry Whitney by Alonzo Gifford Van Nostrand. He and his wife, Sarah (Sadie) Gertrude (Foque) Van Nostrand, made it their home. They previously had lived at 286 Newbury. Alonzo Van Nostrand was a brewer, proprietor of the Bunker Hill Brewery in Charlestown. In October of 1904, he applied for (and subsequently received) permission to construct a garage at the rear of the property. 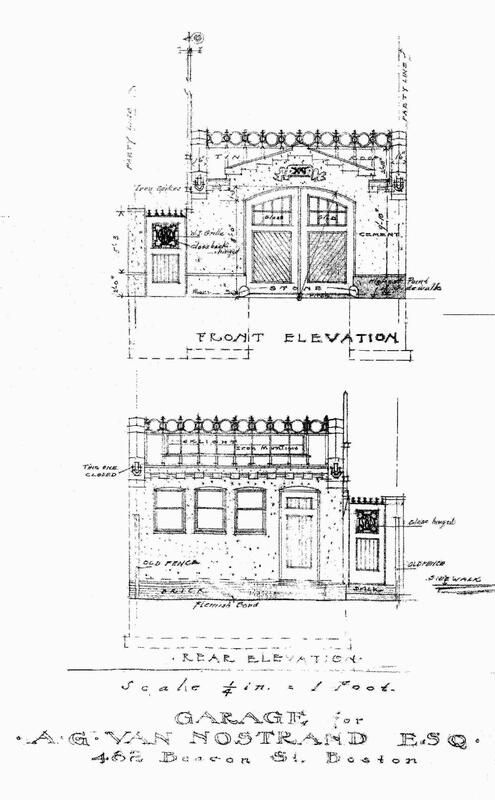 Plans for the garage, designed by New York architect Leon N. Gillette, are included in the City of Boston Blueprints Collection in the Boston Public Library’s Arts Department (reference BIN A-98). Sarah Van Nostrand died in April of 1905. Alonzo Van Nostrand remarried in August of 1907 to Mrs. Jane (Jennie/Jeannie) Bradford (Eldridge) Taylor, the former wife of George F. Taylor. After their marriage, they lived at 482 Beacon, and on February 7, 1911, he transferred the property into her name. The Van Nostrands continued to live at 482 Beacon during the 1919-1920 winter season, but moved thereafter to New Bedford. The house was not listed in the 1921-1924 Blue Books. On July 28, 1922, 482 Beacon was acquired from Jane Van Nostrand by Miss Bertha A. Conlan. She lived in Cambridge with her brother, Patrick H. Conlan, a real estate dealer. On January 27, 1923, 482 Beacon was acquired from Bertha Conlan by Annie Jane (Trimble) Varney, the widow of John R. Varney, who operated it as a lodging house. 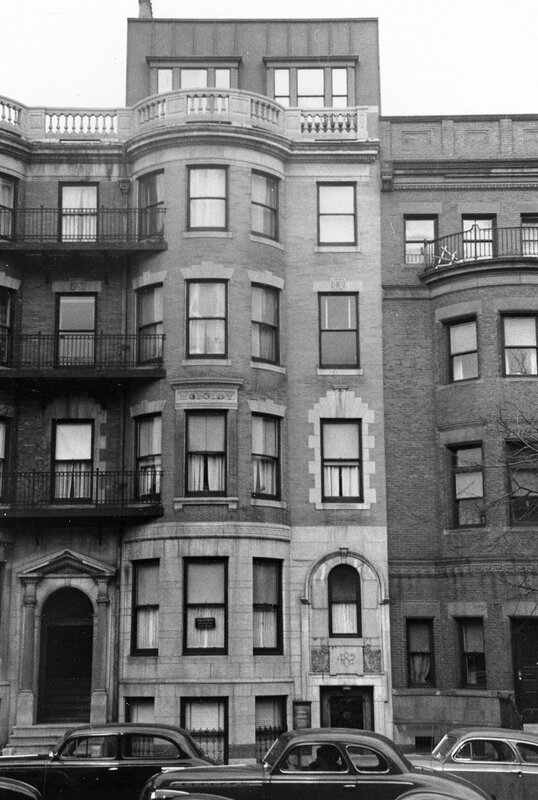 In 1920, she had lived at 139 Newbury, where she also had operated a lodging house. By 1924, she had moved to 272 Newbury. Among Annie Varney’s lodgers in 1923 were John L. Dion and his wife, Emma (Chevalier) Dion. They previously had lived in Norwood. He was a janitor and may have managed 482 Beacon for Mrs. Varney. By the 1923-1924 winter season, they had moved to 228 Commonwealth. On September 14, 1923, the American Trust Company foreclosed on a mortgage it held on 482 Beacon and sold the property to William J. Capron. A retired coal dealer from Oneida, New York, he and his wife, Mary H. (Haigh) Capron, lived at 259 Newbury. On March 31, 1924, 482 Beacon was acquired from William Capron by Eunice E. (Mann) Schneider, the wife of Louis H. Schneider, a clergyman. They previously had lived in Brookline. On the same day, Eunice Schneider transferred the property to her husband and Luther W. Bixby as trustees for the benefit of The Church Invisible. In March of 1924, Louis Schneider applied for (and subsequently received) permission to convert the property from a single-family dwelling into a church and community house. Thereafter, it became the location of The House of Faith and The Church Invisible, of which he served as minister. He also was editor of The Spoken Word. The Schneiders continued to live at 482 Beacon, and to operate The House of Faith and The Church Invisible there, during the 1927-1928 winter season, but moved thereafter to Melrose. 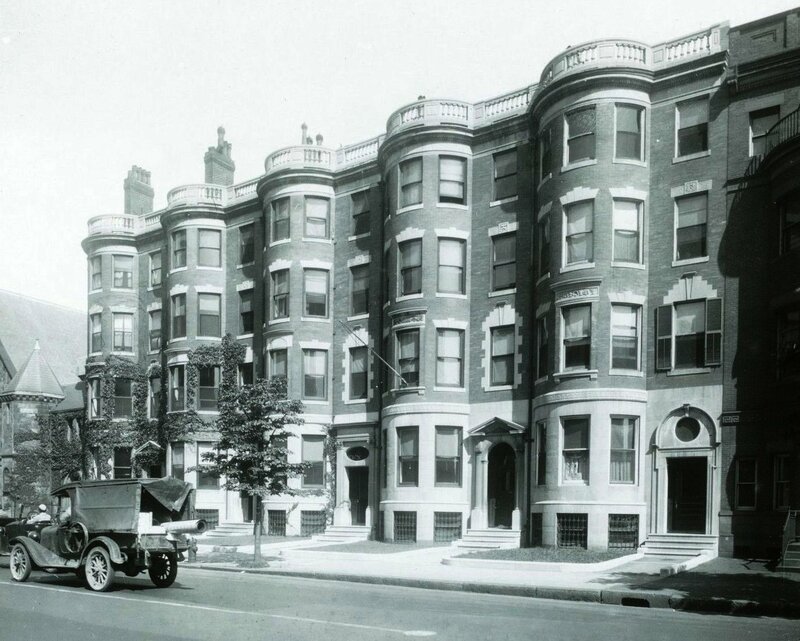 On April 26, 1928, the American Trust Company foreclosed on a mortgage it held on 482 Beacon, and it was acquired by Dr. Joseph Stanton, a surgeon and later chief of staff at St. Elizabeth’s Hospital in Brighton. He and his wife, Mary Elizabeth (Sullivan) Stanton, lived in Newton. Dr. Stanton converted the property into medical offices, including lowering the front entrance and adding a fifth story. Plans for the remodeling, designed by architect Edward T. P. Graham, are included in the City of Boston Blueprints Collection in the Boston Public Library’s Arts Department (reference BIN O-24). Dr. Stanton maintained his office at 482 Beacon. On November 6, 1947, Joseph Stanton transferred 482 Beacon to his two sons, Dr. Richard H. Stanton and Dr. Joseph R. Stanton, both physicians. On May29, 1959, 482 Beacon was acquired from Richard Stanton and Joseph R. Stanton by William J. Bannan, Jr., and Richard W. Sheehy, Jr., trustees of the Sheban Realty Trust. The property changed hands and on July 9, 1962, it was acquired by Sal Realty, Inc. (Michael J. Smith, treasurer). On the same day, Sal Realty transferred the property to Michael J. Smith, Byron F. Angel, and Steven T. Ladoulis. In September of 1962, Byron Angel applied for (and subsequently received) permission to convert the property from medical offices into twelve apartments. The property continued to be held by Michael J. Smith in various partnerships, corporations, and trusts. On March 22, 1968, 482 Beacon was acquired from Michael J. Smith, as trustee of the Weatherfield Associates Trust, by Hubert W. Adams of Wakefield. 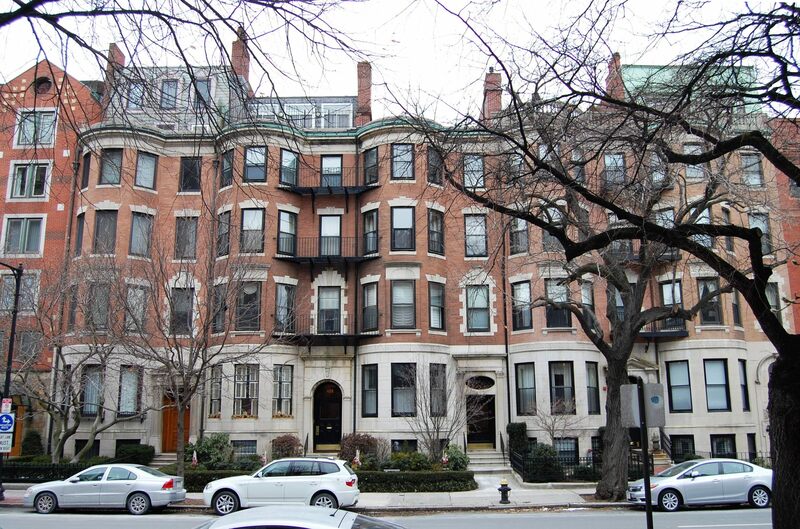 The property changed hands and on December 23, 1971, was acquired by real estate dealer Harold Brown, trustee of the 482 Beacon Street Trust. 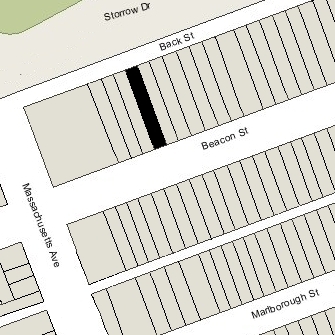 On June 15, 1973, the 482 Beacon Street Trust distributed ownership of 482 Beacon to Harold Brown (4/5th interest) and his brothers, Ronald Brown ( 1/10th interest) and Charles Brown (1/10th interest). Charles Brown subsequently died and on August 9, 1974, his widow, Arlene Ruth (Silverman) Brown, transferred his interest in the property to Harold Brown and Ronald Brown. 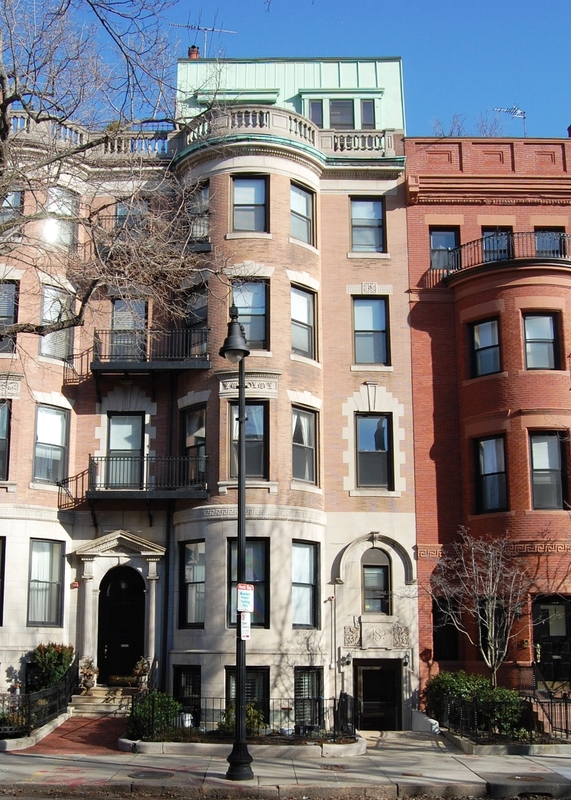 On February 10, 1982, Harold and Ronald Brown converted the property into twelve condominium units, the 482 Beacon Street Condominium.